Music videos contain lots of people singing and looking cool. You too will sing and look cool. Actually, you won’t really sing. You will pretend to sing. You will lipsync instead! 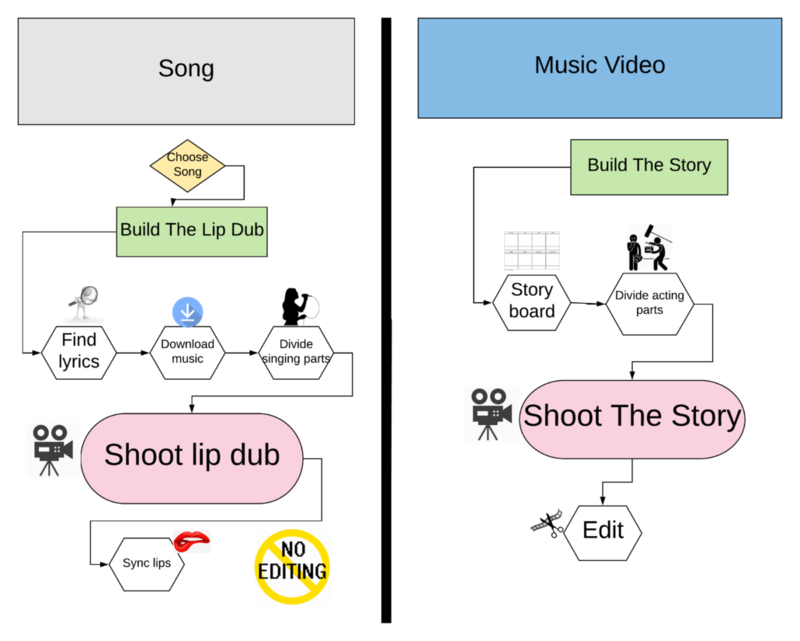 Lip syncing is hard but is a super important part of any music video. Later you will shoot cutaway video to support the lipsync, but don’t worry about that now. Find a song and get your teacher’s permission.No explicit lyrics please. Look at the lyrics for help. Maybe just pick the first 90 seconds. Pick the singer(s) from your group to be filmed. He or she MUST memorize the words or it will look really bad. Eventually, your video will look this this Jon Bon Jovi version. Try to cut on the beat if possible. Count as you listen to the music and cut on the same beat as much as possible. Maybe on 1,2,3, or 4. Whatever beat you like. 2 and 4 are very common. Use lots of movement with your camera. Keep the actor in the middle and move. Not shake, but move. Singers get into it! Look the part and be excited. You will look SO much better if you act it up, maybe even overact, the part. You will look silly if you show little emotion.